This site specific project was commissioned by The Intersection Institute, for the 2008 exhibition Orange: An Art Walk through the Mission, a collection of site-specific exhibitions, located in various buildings in the 16th Street area of the Mission District, that explored responses to the ideas of cleanliness, restraint, surveillance, and other issues related to incarceration. Presented in conjunction with The Prison Project, exhibition at Intersection for the Arts, the walk extended the conversation about the California prison system’s impact on local communities into the community. The "blob" in Cleanliness Is... was made from from reclaimed blue jeans and suspended by lengths of copper and golden thread. 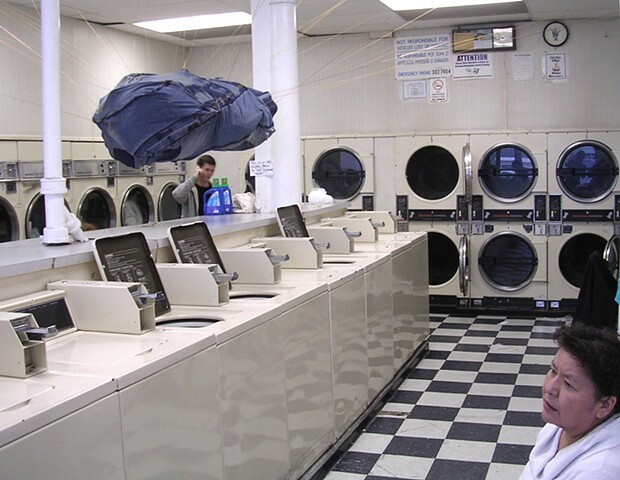 It hovered incongruously within the operating Lavanderia Laundromat, like a monstrous denim wash load come to life. Its improbable presence ruptured the normality of the scene creating a breach, which connected it to the interwoven complexities of denim, incarceration, institutional labor, and cleanliness. This amalgam brought together lauded narratives, such as the invention of the blue jean in San Francisco, by Levi Strauss Co. and the normalization of jeans as a mainstay of mainstream American fashion by The Gap, as well as hidden realities, such as the denim and laundry industries' exploitation of incarcerated labor, and the California Prison Systems own use of denim uniforms.